Google launched the mobile version of Google Maps for Palm Treo. For the moment, it only works for Palm devices with Palm OS 5 and above offered by Cingular and Sprint in the US. 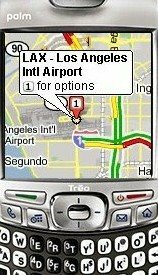 Google Maps for Treo supports all the features available in the other mobile versions: satellite imagery, driving directions, real-time trafic, local search. "Since we first launched Google Maps for mobile devices, we've adapted it to more phones and languages and added features like traffic info. And as of today, the new Palm Treo version answers our top request from users. It's been months in the making, but I think you'll find it worth the wait. We think this is the fastest, slickest version yet, with draggable maps and translucent pop-up balloons that don't hide the map," explains the Google Blog. Maps are one of the most useful mobile applications created by Google and could evolve into many directions, including a real-time travel guide. It's working on my Verizon phone too. Works on my Palm TX using wifi, not as portable, but still very cool!!! The fundamental problem is the inaccuracy of Google Maps (certainly as far as the United Kingdom is concerned) - to the extent that I can't use it. Roads are misnamed.